Buy Meridian Tamari Gluten Free Soya Sauce - 150ml in the UK from our online shop or directly from our independent Scottish store. Meridian tamari soya sauce is free from wheat, gluten and dairy. Please note: due to the high iodine content of the seaweed, this recipe is not suitable for people on thyroid medication. This recipe contains 4tbsp Meridian tamari soy sauce. Sgaia mheat is a vegetarian and vegan meat substitute. We keep the Sgaia Bacon rashers in stock and we can order the steaks and burgers in, just give us a ring or pop in! This recipe contains 2tsp Meridian Tamari Sauce. Vegan sushi made purple using red cabbage! This recipe contains Tamari sauce to serve. Use seasonal vegetables like celery sticks, carrots and sweet or bell peppers. This recipe contains 1 tbsp soy or Meridian tamari sauce. You can make this seasonal pizza recipe in Summer or Winter as kale is in season in both months. This recipe contains 1/2 tbsp tamari. Gluten free soba noodles with fresh vegetables in a chilli peanut sauce This recipe contains 1tbsp soy or Meridian tamari sauce. A fresh, vegan salad made with seasonal vegetables and joint supporting oils. Enjoy with an 'Indian Summer' barbecue, as lunch or as a side dish to Taifun sausages or tofu. This recipe contains 2 teaspoons dark soy sauce. This simple stir fry / salad is both seasonal, healthy and tasty. Serve with (gluten free) bread or noodles. This recipe contains 4 tbsp tamari sauce. As official Meridian stockist, we sell genuine Table Sauces directly from our shop in Scotland and online throughout the UK. Where can you buy real Tamari - 150ml safely online? If you are wondering where you can buy Meridian Tamari Gluten Free Soya Sauce - 150ml safely online in the UK, then shop with us. We are an actual health foods shop; with real people selling real foods and products. Our award-winning independent shop is located in Stirling, Scotland since 1976. You can buy our Organic Food and other genuine Table Sauces in store or safely place an order with us online or over the phone. 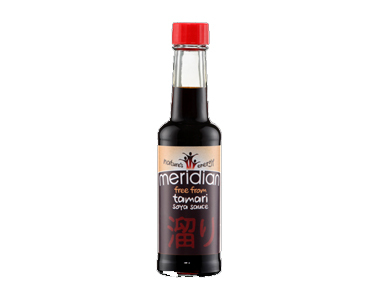 Tamari - 150ml - Meridian Tamari Gluten Free Soya Sauce - 150ml in Table Sauces and Table Sauces & Condiments.